An international survey just released suggests that 15% of people world-wide believe the world will end during their lifetime. The least pessimistic countries were France (6% expect the world to end), Belgium (7%) and Britain (8%). Here in the US people are the most pessimistic, with 22% of people expecting the world to end in their lifetime, the same percentage as in Turkey. 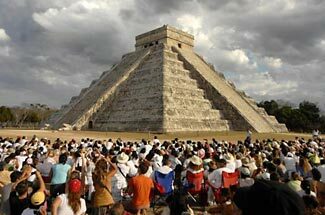 People see the world ending for a variety of reasons, including biblical prophesy and the Mayan 2012 claim. More details here. Now for an important distinction. These people are not preppers. These people expect the world to end; preppers simply expect a major change to the world as we know it; either briefly, or for some more extended period of time. There’s really no way to prepare for the complete end of the world, is there. What use is stockpiled food, a retreat, or anything else if the world just ends! Keep this in mind when talking to others about your views. Possibly one reason that some groups of ill-informed people choose to ridicule or sneer at preppers is their lack of understanding about who we are and what we do. When your friends discover that preppers aren’t strange people, but are normal ordinary people like yourself (hopefully you’re reasonably normal and ordinary!) that challenges their first perception, and when they discover that you don’t expect some type of super-natural Armageddon that is impossible to resist, but rather, you are simply prudently preparing for a range of very possible short and longer term disruptions to our current comfortable lifestyles, that should challenge their other misperceptions, too. After all, wouldn’t you much prefer your friends and neighbors to join you in prepping for future challenges? That way, if/when something does occur, rather than having them trying to get free assistance from you and your own scarce resources, and being a drain on your own preparations; they’ll instead be able to contribute to a larger shared resource of capabilities and materials. There’s no need to be aggressively bothersome about talking about prepping, but if the topic comes up, it is appropriate to talk a little about it. We suggestion you start off from the point that everyone is a prepper already to a greater or lesser extent, and the only distinction between us all is how much we prepare and what we prepare for. That is a positive and inclusionary approach to the topic. More Economic Uncertainty and Risk TEOTWAWKI – By Solar Storm?